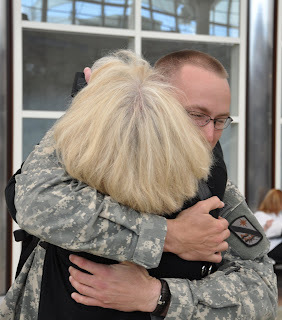 On Monday, our oldest son returned back to Colorado Springs from Afghanistan after being deployed for 13 months. We were able to meet him at the Denver International Airport after his 72 hours of travel from Kuwait. It was so good to get the hugs and see him face to face. We helped him get settled into his apartment, pick up his new Jeep and took him out for non-army food, complete with non-disposable tableware and actual glass goblets. Four weeks to my bucket-list triathlon sprint. It is the last hour panic of must get healthy, must get fit activity. I had forgotten how good you feel when the endorphins kick in after a run. What’s so great is that you can do it all so cheaply. You don’t need to spend money on a gym or buy equipment to get fit. Running outside beats the tread mill for cost and keeping you fresh and inspired. Public Television broadcasts workout programs you can record and follow. The internet has a great yoga videos you can follow along for free. Staying healthy- staying fit helps keep your healthcare cost low and keeps you feeling great. If you are paying a gym membership, now might be the time to suspend it and spend your time outside running or riding a bike. Grab friends to join you on the run or bike ride and make a day of it. Not only will you be saving the cost of your gym membership but you are building a tighter community of friends; all getting healthy together.